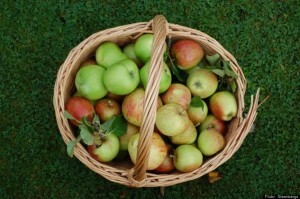 Apples are extremely rich in important antioxidants, flavanoids, and dietary fiber. Two-thirds of the fiber and a ton of antioxidants are found in the peel of an apple. Apples are a great source of the fiber pectin. One medium-sized apple contains 4 grams of fiber. The phytonutrients and antioxidants in apples may help reduce the risk of developing cancer, hypertension, diabetes and heart disease. Apples ripen 6-10 times faster at room temperature than when refrigerated. Apples are a great source of vitamin C, and B complex vitamins such as riboflavin, thiamin and vitamin B6. It takes 36 apples to make one gallon of apple cider.